Twinkle Little Star Baby Shower Favors are unique, will add to your decor, and are sure to be a hit at your Twinkle Twinkle Little Star Baby Shower. Star party favors are available in multiple colors making them perfect for both a boy baby shower or girl baby shower. Includes favor tags that say "Twinkle Twinkle Little Star. Do you know how loved you are?" 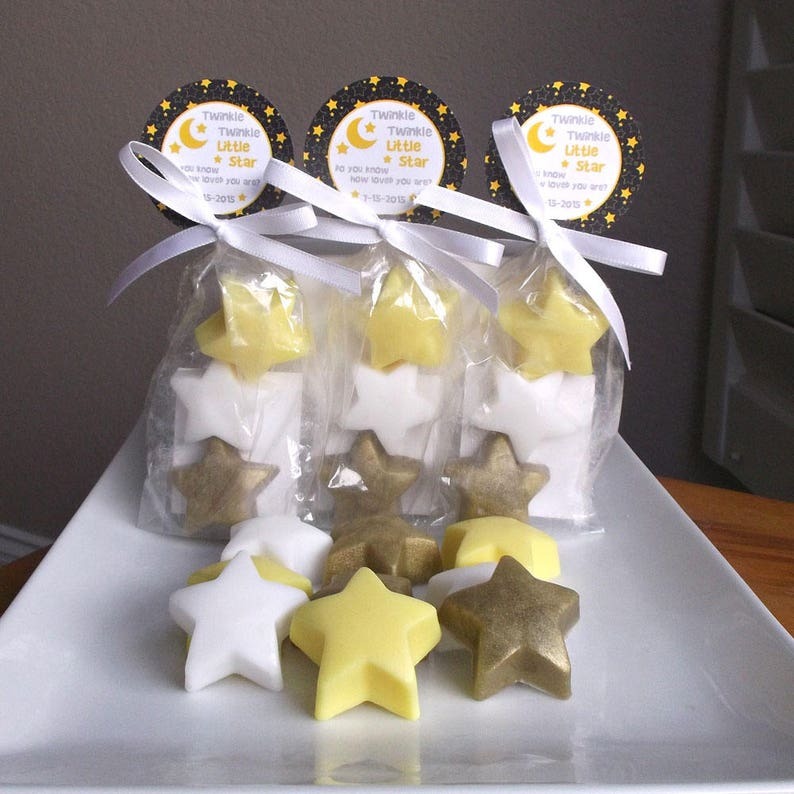 Each order comes with 10 star soap favors (30 soaps in total, 3 per bag). Star soap weighs approximately 1oz. 1) Tag choice. Include the tag number you would like. See the 5th picture. Ingredients: Glycerin (kosher, of vegetable origin), Coconut Oil, Palm Oil, Safflower Oil, Purified Water, Sodium Hydroxide (saponifying agent), Sorbitol (moisturizer), Sorbitan oleate (emulsifier), Oat protein (conditioner), Fragrance, Titanium Dioxide, Iron Oxide, Mica, D&C/Lake colorants. Needed this item quickly and I got it with a day to spare. Lovely little soaps that will make a great baby shower party favor. Smaller then I hoped for but so cute !